An MRI scan shows how the nasal retinal optic nerve has connected to the left hemisphere of the brain (image is inverted). 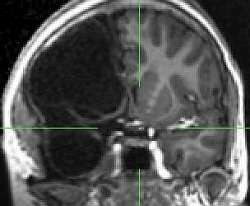 (PhysOrg.com) -- Scientists have discovered how a 10-year-old girl born with half a brain is able to see normally through one eye. The youngster, from Germany, has both fields of vision in one eye and is the only known case of its kind in the world. University of Glasgow researchers used Functional Magnetic Resonance Imaging (fMRI) to reveal how the girl’s brain had rewired itself in order to process information from the right and left visual fields in spite of her not having a whole brain. The right hemisphere in the girl’s brain failed to develop in the womb. Normally, the left and right fields of vision are processed and mapped by opposite sides of the brain, but scans on the German girl showed that retinal nerve fibres that should go to the right hemisphere of the brain diverted to the left. Further, the researchers found that within the visual cortex of the left hemisphere, which creates an internal map of the right field of vision, ‘islands’ had been formed within it to specifically deal with, and map out, the left visual field in the absence of the right hemisphere. Dr Lars Muckli of the Centre for Cognitive Neuroimaging in the Department of Psychology, who led the study, said: “This study has revealed the surprising flexibility of the brain when it comes to self-organising mechanisms for forming visual maps. “The brain has amazing plasticity but we were quite astonished to see just how well the single hemisphere of the brain in this girl has adapted to compensate for the missing half. "Despite lacking one hemisphere, the girl has normal psychological function and is perfectly capable of living a normal and fulfilling life. She is witty, charming and intelligent." 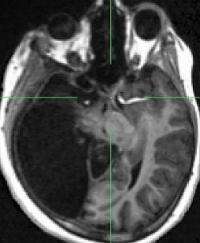 An MRI scan clearly showing only one hemisphere of the brain. The girl’s underdeveloped brain was discovered when, aged three, she underwent an MRI scan after suffering seizures of brief involuntary twitching on her left side. Apart from the seizures, which were successfully treated and slight weakness on her left side (hemiparesis), the girl had a normal developmental and medical history, attending regular school and taking part in activities such as roller-skating. In other cases, where patients have half of the brain removed (hemispherectomy), to treat severe epilepsy for example, one field of vision is lost in both eyes - i.e. they see only objects on the left or right side of their vision. In the case of the German girl, her left and right field vision is almost perfect in one eye. Visual information is gathered by the retina at the back of the eye and images are inverted when they pass through the lens of the pupil so that images in your left field of vision are received on the right side of the retina, and images from the right are received on the left. The part of the retina closest to your nose is called the nasal retina, while the other half is called the temporal retina, as it is next to the temples of the head, and both halves have separate nerve fibres which transmit the information received. Normally, the nerve fibres from the nasal retina cross over in a part of the brain called the optic chiasma and are processed by the hemisphere on the opposite side. The nerve fibres from the temporal retina remain in the same hemisphere, so this means that the left and right visual fields at processed by opposite sides of the brain. However, in this case, the nasal retinal nerve had connected to the left brain hemisphere. The scientists believe the right hemisphere of the girl’s brain stopped developing early in the womb and that when the developing optic nerves reached the optic chiasma, the chemical cues that would normally guide the left eye nasal retinal nerve to the right hemisphere were no longer present and so the nerve was drawn to the left. This implies that there are no molecular repressors to prevent nasal retinal nerve fibres from entering the same hemisphere. The study, which was begun by Dr Muckli at the Max Planck Institute for Brain Research in Germany and involved colleagues at the Institute of Medical Psychology at Goethe-University, Frankfurt-am-Main, is published in the ‘Proceedings of the National Academy of Science USA’. I have officially stopped using the phrase "if you had half a brain..."
Astounding. No psychological impairment? It's hard to believe. Obviously you don't need all of your brain to function, possibly less than half. I'm worried that things may not be so rosy when she becomes an adolescent and an adult. More of your brain comes into maturity and is depended on. I'll be watching this little girl! I have read of cases before where little more than a cerebral cortex was discovered at autopsy. One case in particular was an Oxford University Don, (or Professor), who obviously sufferred little for the lack of grey matter. Glad to see this subject appearring in mainstream publications, rather than hidden in tongue-in-cheak articles of science rags. Seriously, though, what a discovery! If we only could figure out how the brain does this and then learn how to cause the brains of patients who lose half the brain to have their vision "hooked back up"...that would be very cool.